At Custody Simplified, we only publish reviews from verified purchasers. We receive countless letters from parents who have experienced an overwhelming sense of strength and relief after finding and reading the popular guide book, Evidence Strategies for Child Custody. The feedback has been incredibly positive. Our readers are reporting great success when implementing the clear & concise strategies for winning a child custody case and protecting the child’s rights and wellbeing during a dispute. “When my ex started making false accusations against me soon after our separation, I was terrified that she would succeed in taking my daughter from me. Erik has done diligent work with case studies, research, interviews and first hand experience that made this an invaluable resource for me. “This book helped me WIN my custody case with flying colors. I purchased this book directly from Mr. Dearman’s website, custodysimplified.com, back in January of this year, after getting served with papers from my ex seeking to take full physical custody of my daughter. Like most people, I did not take this lightly. I scoured the internet, high and low, for nearly 7 full days… and all of the information was overwhelming. The majority of sites covered a small slice of information, but were actually lawyers advertising their services that ran in the THOUSANDS of dollars, which I could not afford. Some sites only covered the court process, others covered how to handle the situation (oftentimes, with POORLY written advice), horror stories of others, and legal language that the layman would be confused and flustered by. I felt like going crazy up until that point, with fear, panic, anger, and hopelessness. Then, I came across Mr. Dearman’s website, and I read through a few blog posts, and then an excerpt of the book. What I saw was so comforting (I’ll explain more on that in a moment). Feeling at my wits end, I decided to purchase the book, and I can say, with 100% sincerity, that this book saved me. I was no longer scared. I was empowered, I was enlightened, and most importantly, I felt prepared. This book is clear, concise, easy to read, and chock full of rational, logical advice. It tells you how to behave during this highly stressful time where your emotions are running high. It gives you a clear list of warnings, and things to avoid that look bad in court that you wouldn’t cognitively rationalize on your own. It tells you what to expect through the whole process, so you are prepared for anything. What I found most important, is that it lays out a plan of action for you, that is super easy to follow, all-inclusive, easy to complete. Just check off each point as you go. When it was time to go to court, I had compiled a neatly organized book that made the judge’s eyebrows raise in amazement when he looked through it. He even commended the work that I had done, while my ex had a few jumbled papers printed out as “evidence”. I had spent immeasurable hours searching for what to do, and this book has it all in one place. Needless to say, I won the case, my ex had to pay my attorney fees, and I have my baby!!!! ***HERE’S THE KICKER*** This book was initially marketed toward father’s (the new version is not). I am a woman! If you’re going through a custody battle, this will be the most valuable couple of dollars you will ever spend. Did the strategies help your case? 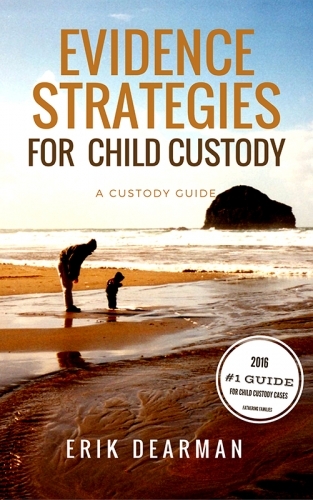 Contact us to share your story or review of the Evidence Strategies for Child Custody guide book. Sharing feedback greatly helps us to develop the best resource possible and encourages fellow parents navigating this stressful experience that there’s hope and accessible guidance.